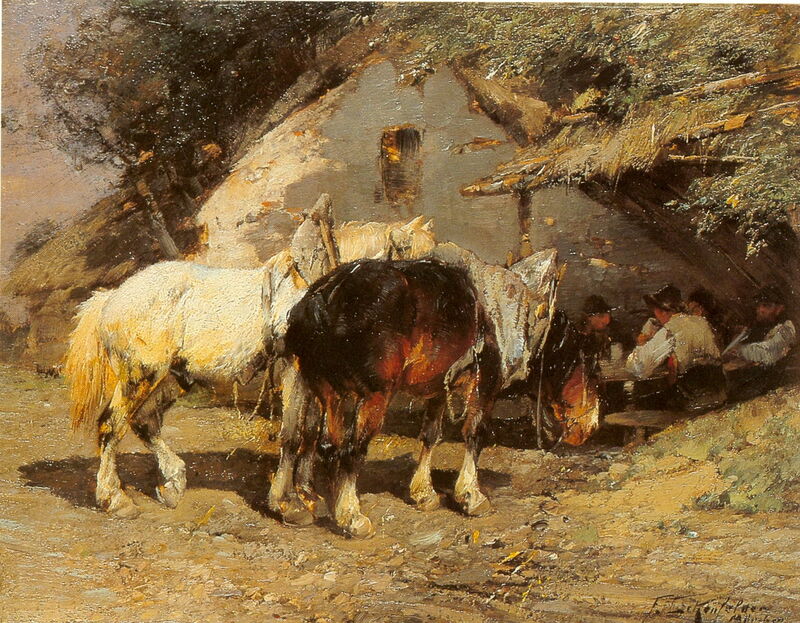 Friedrich Eckenfelder (1861–1938), Two Horses Being Washed (1909), oil on canvas, 61 x 96 cm, Private collection. Wikimedia Commons. Relatively little has been written about painting in Germany during the late nineteenth and early twentieth centuries. Far from being stolid or backward, it saw as much change as that in France, and its cities enjoyed lively and innovative arts scenes. Among its many painters was Friedrich Eckenfelder (1861-1938), whose works include some of the period’s finest paintings of horses, farm animals, and the deep countryside. Eckenfelder was born in Bern, Switzerland, but his family moved to Balingen, Germany, when he was very young. Balingen is a country town in the Swabian Alps, roughly midway between Stuttgart and the Swiss border near Zürich. His talent for drawing was discovered early, and as a boy he transferred to take drawing classes with Professor Oskar Hölder in Rottweil. From there he progressed to Munich’s Academy of Fine Arts in 1878, where he lived some of the time with Marie Junginger, a portrait painter fourteen years older than him, who gave birth to their son in September 1879. Eckenfelder was also a private pupil of Heinrich von Zügel, who remained a friend, although their styles diverged; von Zügel tried to secure Eckenfelder an appointment at the Academy, but Eckenfelder’s intense introversion proved an insurmountable obstacle. Eckenfelder’s first major success was with a landscape painting, which was shown at an international exhibition in Munich’s Glaspalast in 1883, and was purchased by the Prince Regent of Bavaria. 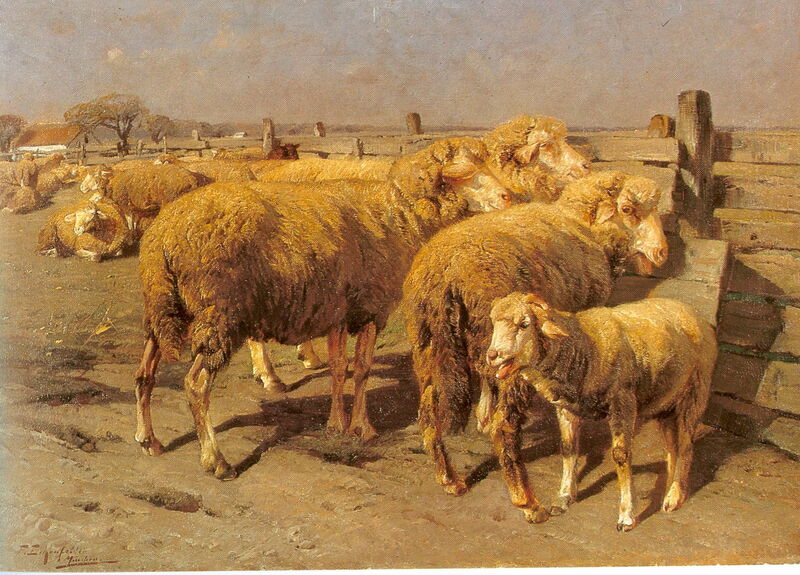 Friedrich Eckenfelder (1861–1938), Sheep in the Pen (1884), oil on canvas, 20 x 28 cm, Eckenfelder Galerie, Balingen, Germany. Wikimedia Commons. 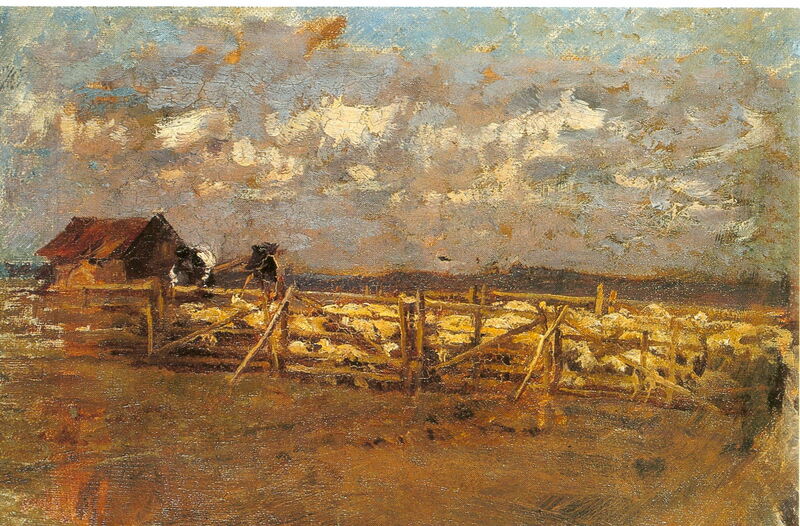 One of his early works, Sheep in the Pen (1884) shows how remarkably loose and painterly he could be, with rich browns and earth yellows. At first this might appear to have been painted entirely en plein air, but the careful detail in the fencing suggests that it was at least finished in the studio. 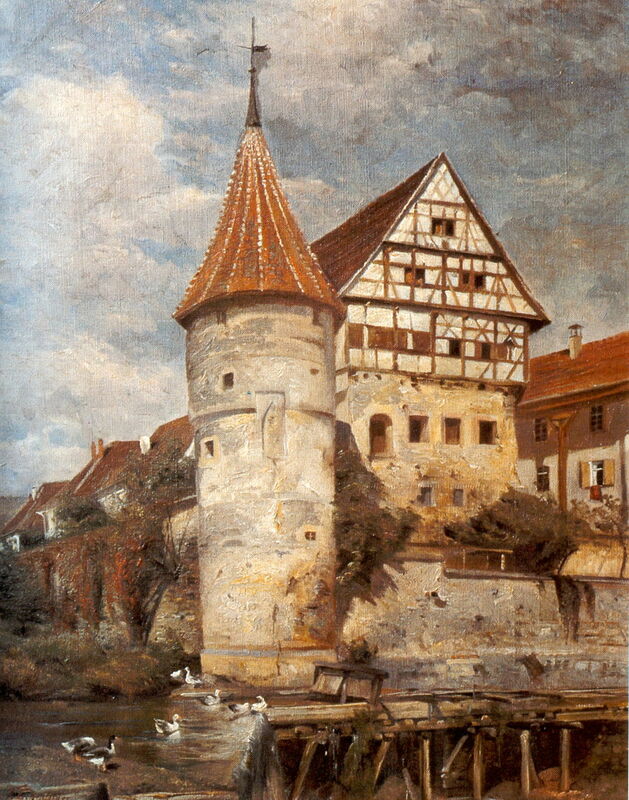 Friedrich Eckenfelder (1861–1938), Zollernschloss, Balingen (c 1884-5), oil on wood, 16.8 x 22.8 cm, Private collection. Wikimedia Commons. Zollernschloss, Balingen (c 1884-5) proved to be one of his favourite motifs. Despite the smaller size of this painting, his brushwork is far tighter and has a more detailed realism than many of his more rural views. Friedrich Eckenfelder (1861–1938), A Farmer Feeding his Horses (c 1886), oil on wood, 30 x 43 cm, Private collection. Wikimedia Commons. Eckenfelder’s paintings of horses were justly popular. 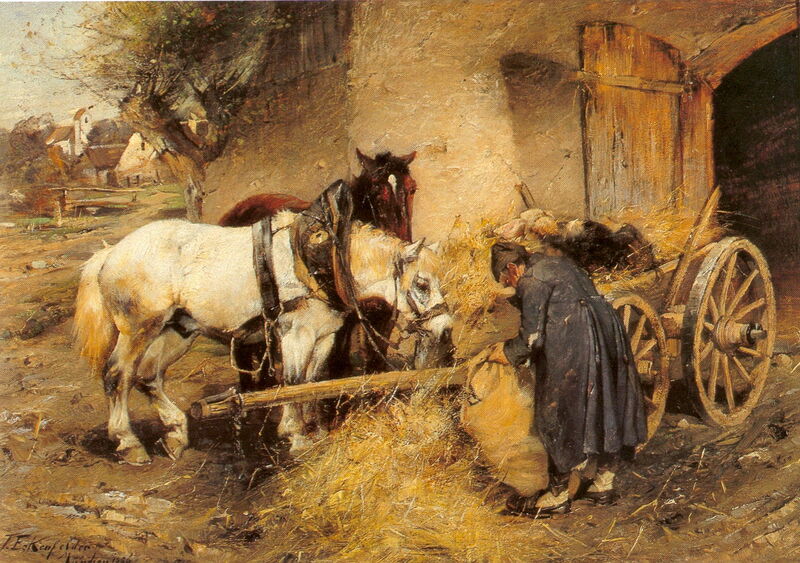 His A Farmer Feeding his Horses (c 1886) shows the more typical balance which he struck in these earlier paintings between depiction of horse and man, and between tight detail and the painterly. 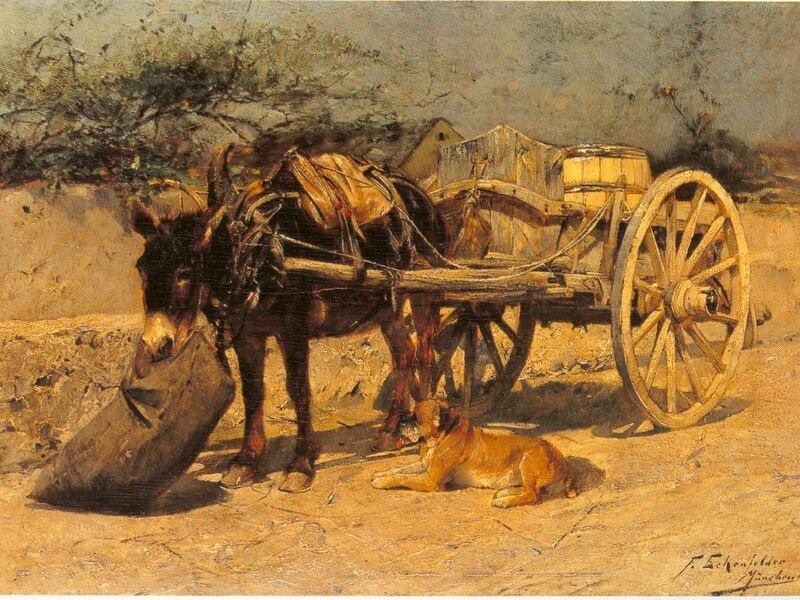 Friedrich Eckenfelder (1861–1938), Mule Cart (c 1887), oil on wood, 25.5 x 37 cm, Private collection. Wikimedia Commons. He sometimes dispensed with humans altogether, as in his Mule Cart (c 1887), a trait which became increasingly common in his later paintings. Friedrich Eckenfelder (1861–1938), Lunchbreak by the Cottage (1888), oil on wood, 16.5 x 22 cm, Private collection. Wikimedia Commons. Lunchbreak by the Cottage (1888) is a small painting dominated by his marks, which still manages to capture the detail of the horses’ tack. That year, his painting Ploughing Horses attracted critical praise, and was another purchased by the Prince Regent of Bavaria. Friedrich Eckenfelder (1861–1938), Sheep in the Pen (c 1890-2), oil on canvas, 44 x 64 cm, Private collection. Wikimedia Commons. Some of his animal portraits were rich in fine detail: his Sheep in the Pen (c 1890-2), for example, appears to have been the result of long periods of careful work in the studio. In these works, he perhaps referred back to the painting of Constant Troyon in France, in the early 1800s. In 1892, he was one of the founding members of the Munich Secession, which broke away from the establishment of the Salon, and exhibited regularly with the movement until 1911. This preceded the Vienna Secession, of which Gustav Klimt was the first president. In the years before the First World War, he enjoyed considerable success, and his paintings were often purchased by the King of Württemberg, or through dealers in Munich and the rest of Germany. Friedrich Eckenfelder (1861–1938), Balingen with Heuberg (1893), oil on canvas on plywood, 31 x 57 cm, Eckenfelder Galerie, Balingen, Germany. Wikimedia Commons. 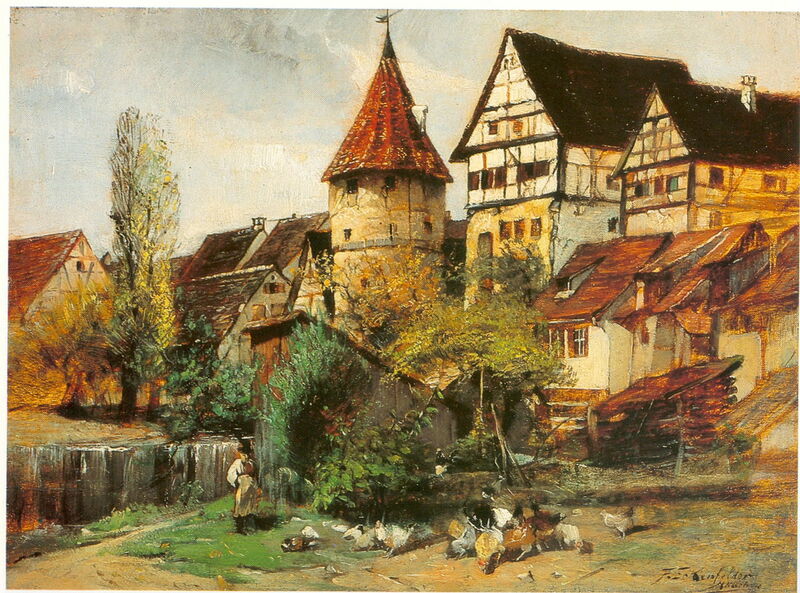 Balingen with Heuberg (1893) is more in keeping with his early painterly style. This shows his home town of Balingen against the low but quite rugged hills of the Swabian Alps. 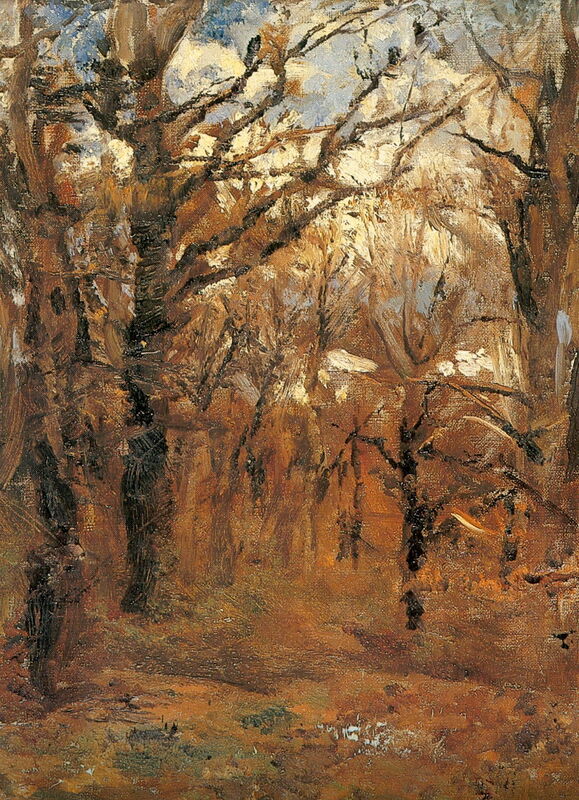 Friedrich Eckenfelder (1861–1938), The Forest in Early Spring (1895), oil on canvas, 46 x 30 cm, Eckenfelder Galerie, Balingen, Germany. Wikimedia Commons. Over this period, Eckenfelder’s landscapes transformed to the distinctly Post-Impressionist. His The Forest in Early Spring (1895) is as radical as, for example, Cézanne’s landscapes of this time, although his brushstrokes were not regimented and his palette remained dominated by the earth colours more appropriate to this region. Friedrich Eckenfelder (1861–1938), Zollernschloss in Balingen (1895), oil on canvas, 48.5 x 38.5 cm, Private collection. Wikimedia Commons. When painting motifs like Zollernschloss in Balingen (1895), Eckenfelder showed how little his studio style had changed over the previous decade. Friedrich Eckenfelder (1861–1938), Oxen in the Afterglow (1900), oil on canvas on wood, 25 x 30 cm, Private collection. Wikimedia Commons. Once out painting the country en plein air, though, he was far more radical, as shown in his Oxen in the Afterglow (1900). Here he has applied high chroma earth colours quickly and thickly. 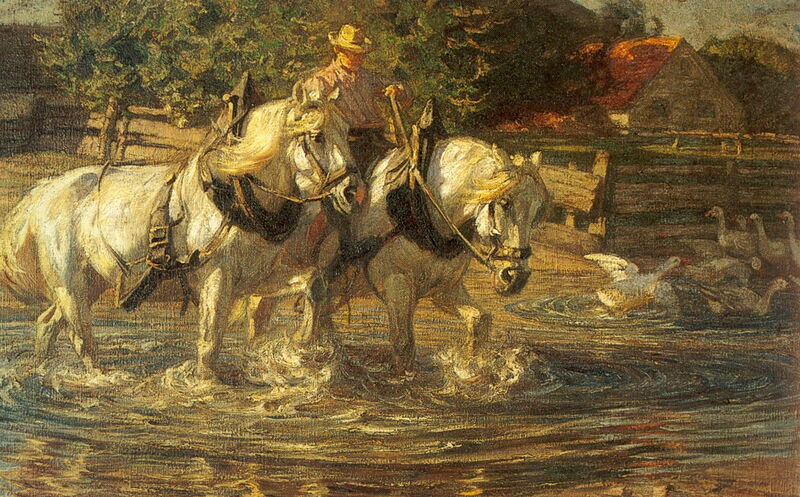 Two Horses Being Washed (1909), one of his larger studio canvases, shows his distinctive handling of water, particularly where it has been agitated by the horses. 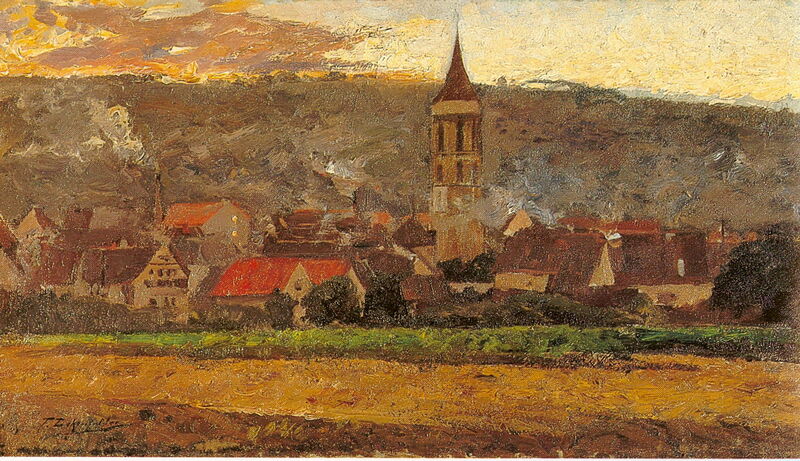 Friedrich Eckenfelder (1861–1938), Steinach with Plettenberg (1910-23), oil on cardboard, 17 x 23 cm, Private collection. Wikimedia Commons. 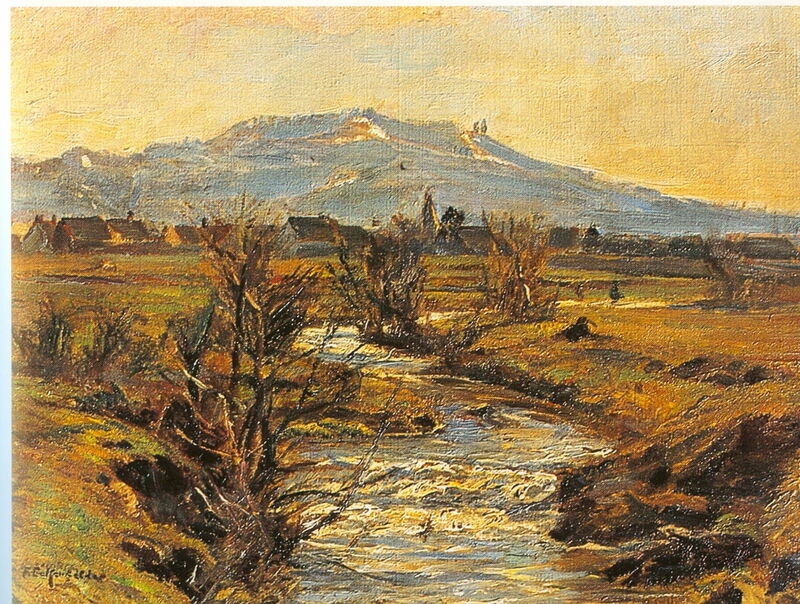 Steinach with Plettenberg (1910-23) was painted en plein air, and shows the village of Steinach in the middle distance, with one of the higher mountains in the region of Balingen, Plettenberg, rising to 1002 metres behind it. This was probably painted at dusk in the late autumn, as the trees are leafless but the ground free of snow, and the river not swollen. After the First World War, his fortunes changed, and he gradually withdrew to his home town of Balingen, where he retired in 1922. 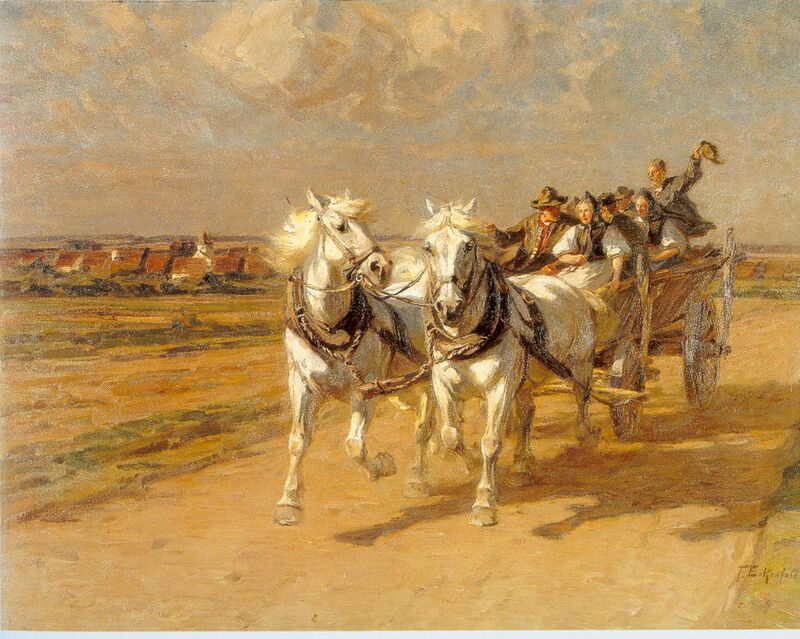 Friedrich Eckenfelder (1861–1938), White Horses with a Jolly Peasant Group in the Wagon (c 1920), oil on canvas, 86.5 x 112.5 cm, Private collection. Wikimedia Commons. White Horses with a Jolly Peasant Group in the Wagon (c 1920) is one of his largest studio paintings, and shows a merry group of local landsfolk out for a drive in a hay wagon. It captures a happy moment during the interlude between the World Wars, in a Germany that was soon to be changed, first by politics and the rise of Hitler, then by war, and finally by the huge social and economic changes which followed. These fields are now housing estates, the horses replaced by tractors, and the traditional farmers long gone. 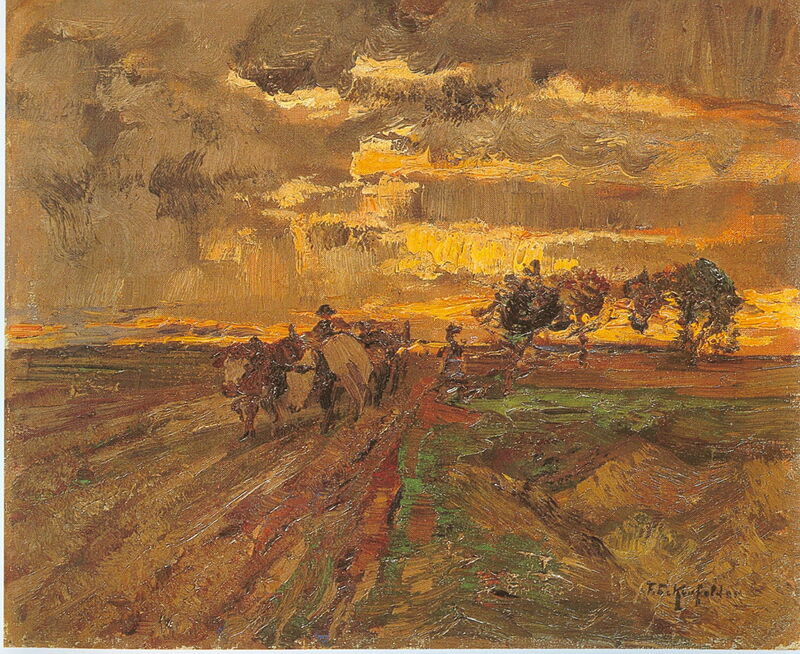 Eckenfelder was a quiet and reserved artist, whose paintings not only captured the German countryside of a long lost era. He was every bit as radical as the avant garde in France, but even in Germany, seems to have slipped just as quietly into obscurity. Posted in General, Painting and tagged Eckenfelder, Germany, Impressionism, Klimt, Munich, painting, Post-impressionism, Secession. Bookmark the permalink.